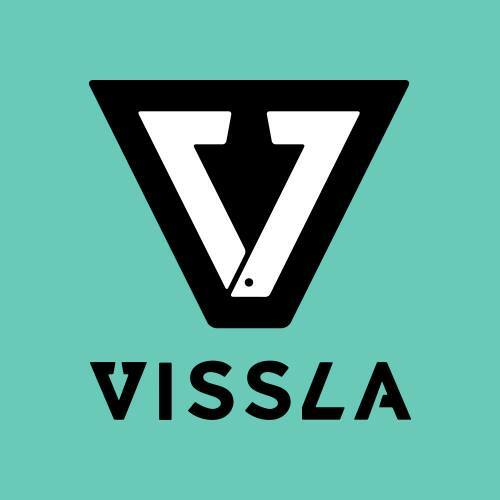 On the penultimate day of the 2016 VISSLA ISA World Junior Surfing Championship, Team France surged into the lead, putting themselves in position to make history and win their first-ever Team Gold Medal in the competition. Team France, which had been closely trailing Team Australia for the past few days, finally overtook the lead on Day 8, with five competitors remaining for the Final Day of competition. Click here to check the final team results. In the afternoon, Team Hawaii won the Gold Medal in the ISA Aloha Cup, the first Junior Gold Medal awarded in the era of Olympic Surfing. An event unique to the ISA, the Aloha Cup is a tag-team style competition featuring four boys and one girl from each team. Each athlete rides a total of two waves during the hour long Final, where the waves from all five team members are summed to get the total team score. The U-16 and U-18 Boys kicked off Saturday morning in sunny weather and light wind. The strong wind from the previous night left a bump on the ocean, however there was plenty of swell on tap to make contestable conditions for the world’s best junior surfers to display their talent. The Boy-s U-18 Quarterfinals were the first of the day, where Brazil’s Weslley Dantas continued to be the standout performer of the competition and marked the highest heat score of the round with 13.77. Hawaii’s Kaulana Apo and Cody Young were matched up in their Quarterfinal heat and strategically used priority and positioning to help each other advance. Young (14.5) and Apo (10.46) finished first and second, eliminating the 2014 U-16 Gold Medalist, France’s Leo Paul Etienne (9.7), and South Africa’s Adin Masencamp (8.86). The Boy’s U-16 Quarterfinals ensued, with a strong showing from Team France and Team Japan. In the first heat, Japan’s Yuji Mori marked the round’s highest heat score (13.17) and advanced to the Semifinal where he will surf against his teammate Yuji Nishi. 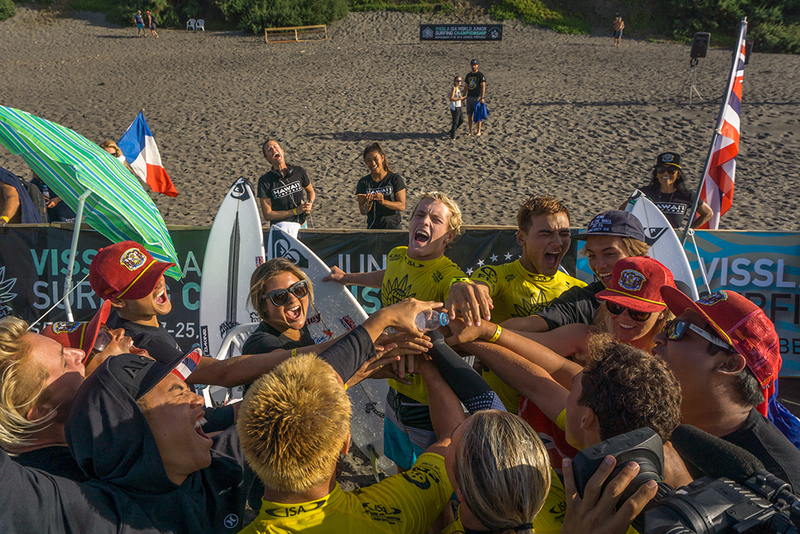 Both France and Japan advanced two competitors to the Semifinals along with USA’s Eithan Osborne and Australia’s Kyuss King. “As the last boy remaining on Team USA in the competition, there is a ton of energy from my team supporting me. I feel strong and confident that I can do well. Capping off the day of individual competition, the Girls U-16 and U-18 Quarterfinals ran in clean conditions with a newly arriving swell. In the Girls U-18 Quarterfinals, Nina Reynal helped France’s push for the Team Gold Medal and notched the highest heat total of the round with 11.36 points. Team France’s U-18 girls remain fully intact as Reynal’s teammate, Juliette Brice, will join her in the Semifinals along with two Costa Rican’s, Emily Gussoni and Leillani McGonagle, which is the other team fully represented in the division. In the Girls U-16 Quarterfinal, the defending Gold Medalist, Summer Macedo (HAW), was surpassed and eliminated in the final minutes of the heat by Great Britain’s Ellie Turner. After the eliminations of Macedo, France’s Leo Paul Etienne and Hawaii’s Mahina Maeda, there are no longer any past Gold Medalists remaining in the competition. Four new Gold Medalists will be crowned in the Finals on Sunday. USA’s Caroline Marks followed up her fantastic performance on Friday and took first place in her Quarterfinal heat, scoring a 12.06 that was the highest of the round. Marks went on through to the Semifinals along with Great Britain’s Ellie Turner, leaving Macedo (9.13) and Australia’s Pacha Light (5.3) in third and fourth place. 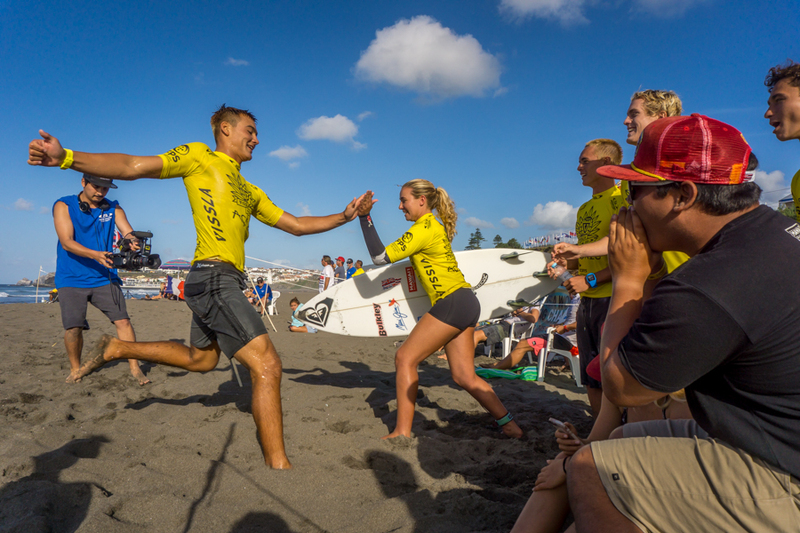 The ISA Aloha Cup created an action packed finish to the end of Saturday’s competition, with Team Japan, France, Costa Rica and Hawaii battling for the first Gold Medal of the competition. After an hour of heated wave exchanges in the low tide conditions, Team Hawaii came out on top with 46.02 points, winning the first ISA Aloha Cup Gold Medal in the era of Olympic Surfing. “Winning the first Gold Medal of the event is so incredible, especially now that Surfing is an Olympic sport. “Our game plan was to give 10 minutes for each of our first four competitors and 20 for me because I was the last to surf. I only ended up getting 12 minutes, but the boys all got good rides and we worked great as a team. Team France earned the Silver Medal with 43.64 points, Team Costa Rica earned Bronze with 39.47 points and Team Japan earned Copper with 38 points. “I would like to give a big congratulation to Team Hawaii for winning the first ISA Aloha Cup Gold Medal in the Olympic Surfing era. They showed impeccable teamwork and camaraderie during their historic performance. 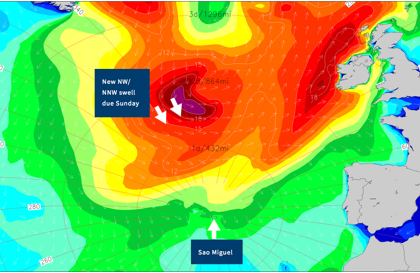 Surfline, the official forecaster, is predicting excellent conditions for the Final Day of competition. A new shoulder to head high swell will fill in and be paired with light offshore winds. Times in Azores Standard Time. 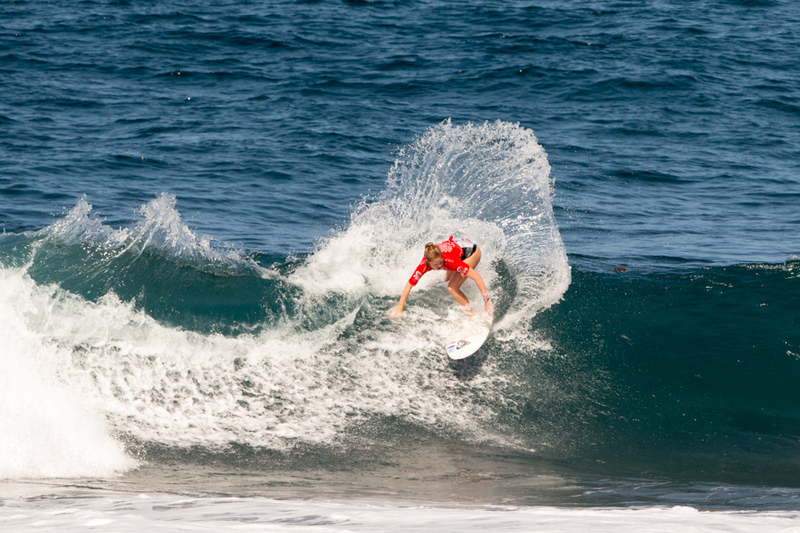 Tune in to watch the live action on www.isaworlds.com.